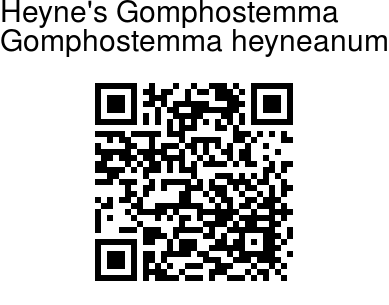 Heyne's Gomphostemma is a subshrub with stem obtusely 4-angular, densely covered with starry hairs. It is named for Dr B Heyne, German botanist and traveller. Leaves are 25 x 15 cm, broadly elliptic, pointed at both ends, thickly hairy below, sparsely hairy above, toothed, nerves 5-7 pairs. Leaf-stalks are 4-6 cm long. Flowers are borne in racemes 18 x 2.5 cm. Flowers are 10 to 20 together, densely packed, bracts elliptic, pointed. Calyx is 1.2 cm long, lobed to the middle, lobes lanceshaped. 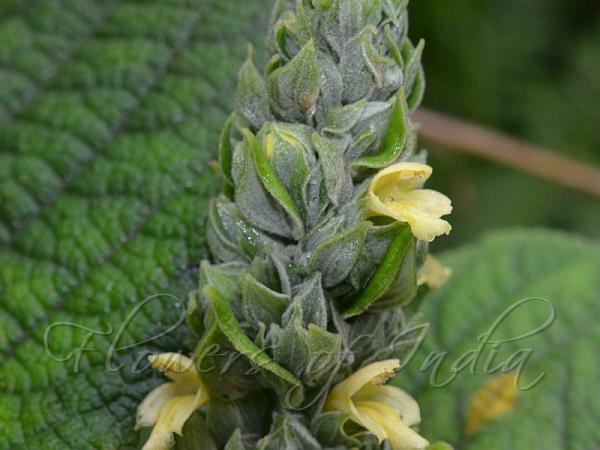 Flowers are 1.5 cm long, tube 7 mm broad, cylindric, midlobe of lower lip blunt, notched, filaments unequal, hairless. Nutlets are smooth. Heyne's Gomphostemma is endemic to Southern Western Ghats. Identification credit: Vinaya Raj Photographed at Abbey Falls, Coorg, Karnataka.